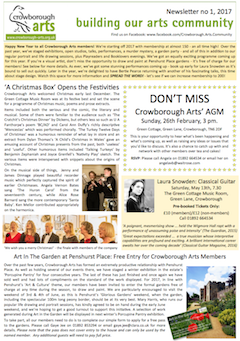 Our newsletter keeps you up to date with what’s happening in Crowborough Arts. Would you like to be featured or to write a review for us? If you have any content for the newsletter please contact Gaye Jee. Interim news can be found on our blog in Latest News. Once again, the year has zipped past and Christmas is fast approaching! We’ve got lots of plans already for next year, including some great music events, celebrity talks (shh, still under wraps!) and with any luck, a return visit from Geoff Hutchinson, who gave us such a vivid portrayal of Rudyard Kipling. Coming up before the end of this year though, we have our talk on The Golden Days of Variety, presented by Dean Caston, which he will illustrate with slides and sound recordings. A couple of weeks after that, authors Tessa Boase and Davina Langdale will speak about their latest writing, and we’re especially looking forward to Alessandra Testai & Robin Jeffrey returning in mid-December with a programme of Christmas music. If you enjoy what we do, please tell your friends about Crowborough Arts - we’re always looking to expand our numbers. And at just £15 a year, membership would make a great stocking-filler for someone this festive season! ​We don’t want to wish the remaining few weeks of summer away, but we’ve been planning for autumn and winter and have put together an exciting programme. 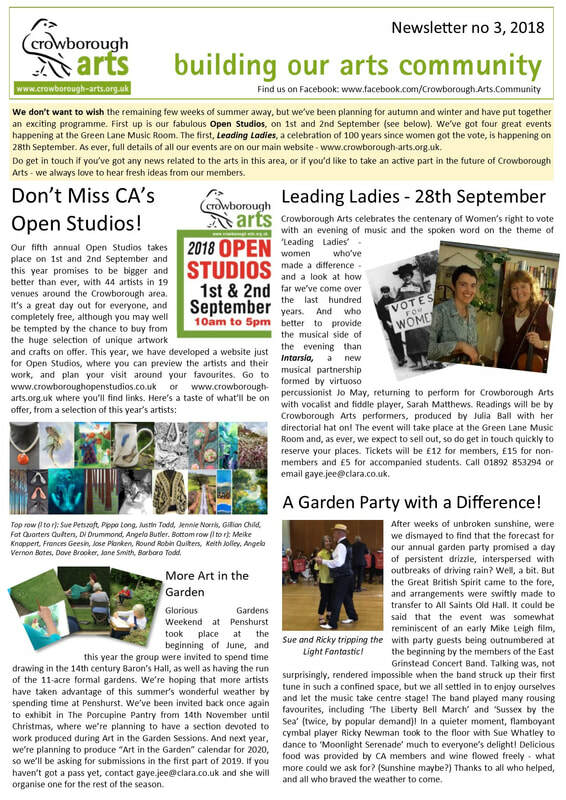 First up is our fabulous Open Studios, on 1st and 2nd September (see below). We’ve got four great events happening at the Green Lane Music Room. The first, Leading Ladies, a celebration of 100 years since women got the vote, is happening on 28th September. 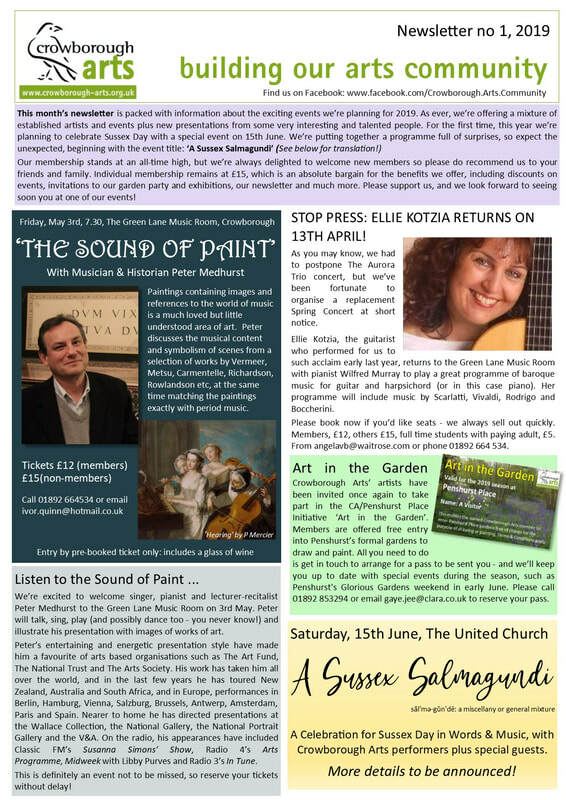 As ever, full details of all our events are on our main website - www.crowborough-arts.org.uk. 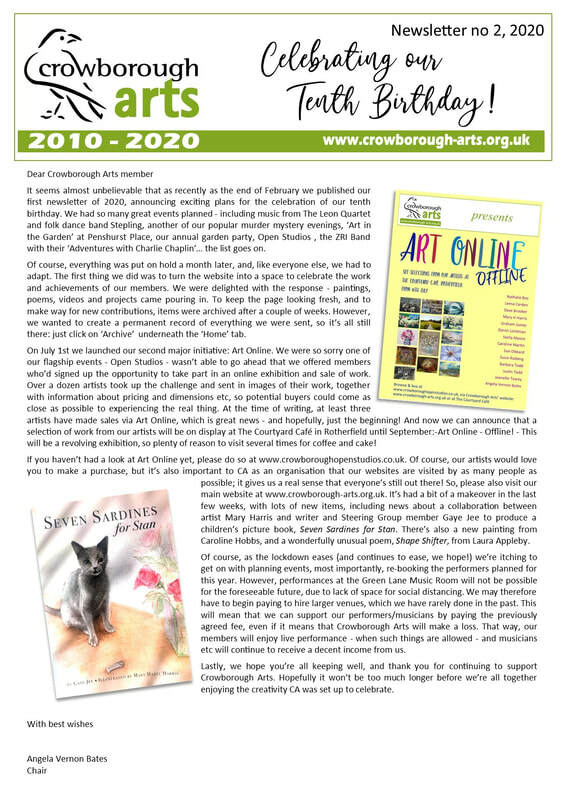 Do get in touch if you’ve got any news related to the arts in this area, or if you’d like to take an active part in the future of Crowborough Arts - we always love to hear fresh ideas from our members. We’re delighted to announce that our membership numbers are at an all-time high, with around 170 subscribers, and we’ve had over 200 ‘likes’ on Facebook! As you’ll see below, we’ve an action-packed 2018 planned, with more events in the pipeline. For the literary-minded, we’ve a talk by Rudyard Kipling himself, aka Geoff Hutchinson. Geoff often portrays the great man at ‘Batemans’, the author’s home, and this is sure to be an absorbing and fascinating evening. Our murder mystery evening is a fund-raiser for Crowborough Arts - and we can’t think of a more entertaining way to raise money! Prepare to laugh as you puzzle your way through solving the crime. Don’t forget to visit our website for full details of upcoming events, including our portrait and life drawing sessions. 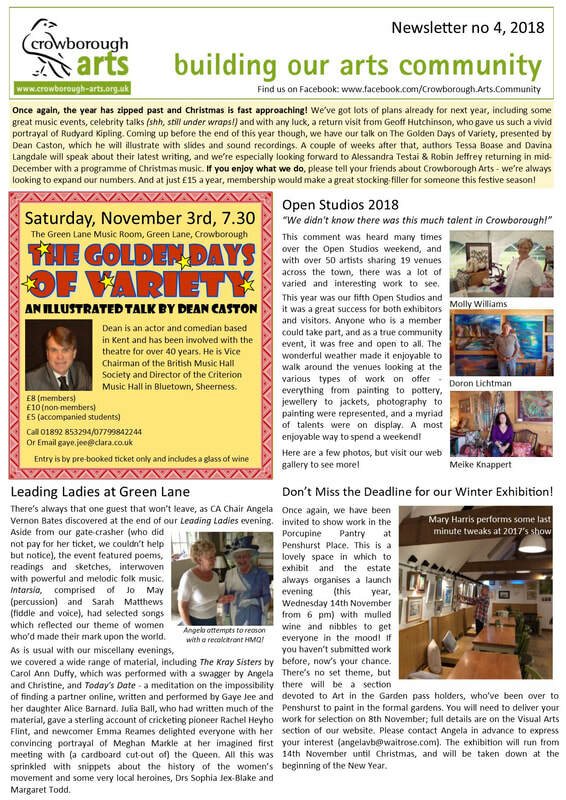 ​2018 promises to be even more action-packed than previous years: In addition to an all-time high in our membership numbers, we have a record number of fascinating talks, Open Studios, wonderful music and a brilliant murder mystery evening to look forward to, as well as our regular workshops including life and portrait drawing sessions, Playreaders and Booklovers. We’ve launched a new ticket price to encourage younger people to attend our events held at The Green Lane Music Room: anyone between the ages of 15 and 25 is eligible to buy a ticket for our music or performance events for just £5, providing they are accompanied by an adult paying for a full price ticket. Another innovation is a new website devoted to Open Studios: www.crowboroughopenstudios.co.uk. 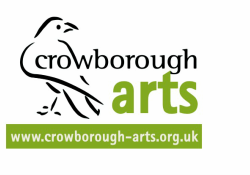 You can access it directly, or via a link from www.crowborough-arts.org.uk. We look forward to seeing you at one or more of our events! We’ve had a busy year once again, with membership at an all-time high, three major visual arts events, two illustrated talks, a garden party, two of our home-produced performance evenings, half a dozen music recitals, and our regular life and portrait sessions, together with Booklovers and Playreaders. Added to this, we’ve completely revamped the website and awarded two bursaries - and we’ve also introduced a new student (15 - 25) rate of £5 for events at the Green Lane Music Room. Next year is under development, with a talk on The Medieval Garden booked, and another on the History of Music Hall in the pipeline. And things are already kicking off for September’s Open Studios! If you’re not already a CA member - we’d love to have you. You’ll benefit from substantial discounts on our events, our newsletter, and access to a free Art in the Garden pass. With the long evenings and - mostly - good weather upon us, our programme for the summer is well underway. Glorious Gardens weekend over at Penshurst Place was a great success, and as you’ll see below, is a continuation of our relationship with the estate that has resulted in so many enjoyable events over the past few years. 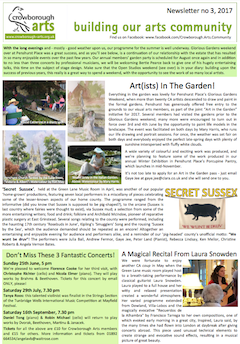 Our annual members’ garden party is scheduled for August once again and in addition on to no less than three concerts by professional musicians, we will be welcoming Bertie Pearce back to give one of his hugely entertaining talks, this me on the subject of stage design. Make sure that the Open Studios weekend (see page 2 on this newsletter) is in your diary: building upon the success of previous years, this really is a great way to spend a weekend, with the opportunity to see the work of so many local artists. ​Crowborough Arts is now into its seventh year, and continues to expand, both in member numbers and what we offer. In addition to all our regular art sessions, exhibitions, concerts, groups, talks and performances, we’re delighted to say that two of our members, Leesa Carden and Deborah Tompsett, are now working in the community to bring hands-on creativity to a residential home and a primary school respectively. Our new-look website is (dare we say?!) nearing its launch, so watch out for the great reveal on that! 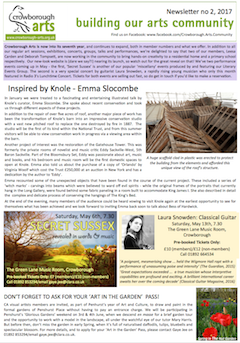 We’ve two performance events coming up in May - the first, ‘Secret Sussex’ is another of our popular ‘miscellany’ events produced by and featuring our Literary Events Group. The second is a very special concert by guitarist Laura Snowden, a rapidly rising young musician who only this month featured in Radio 3’s Lunch me Concert. Tickets for both events are selling out fast, so do get in touch if you’d like to make a reservation. 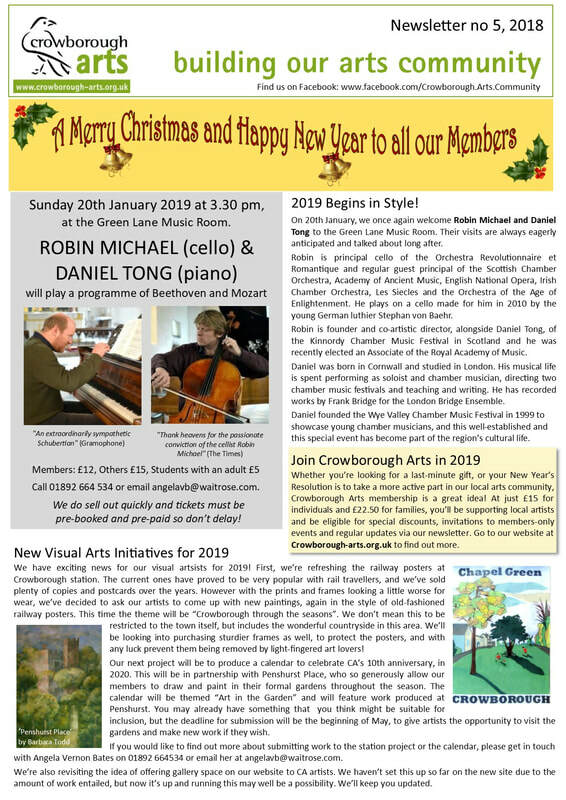 ​Happy New Year to all Crowborough Arts members! We’re starting off 2017 with membership at almost 150 - an all time high! Over the past year, we’ve staged exhibitions, open studios, talks, performances, a murder mystery, a garden party - and all of this in addition to our regular portrait and life drawing sessions, plus Playreaders and Booklovers evenings. We’ve got an equally exciting programme coming up for this year. If you’re a visual artist, don’t miss the opportunity to draw and paint at Penshurst Place gardens - it’s free of charge for our members! 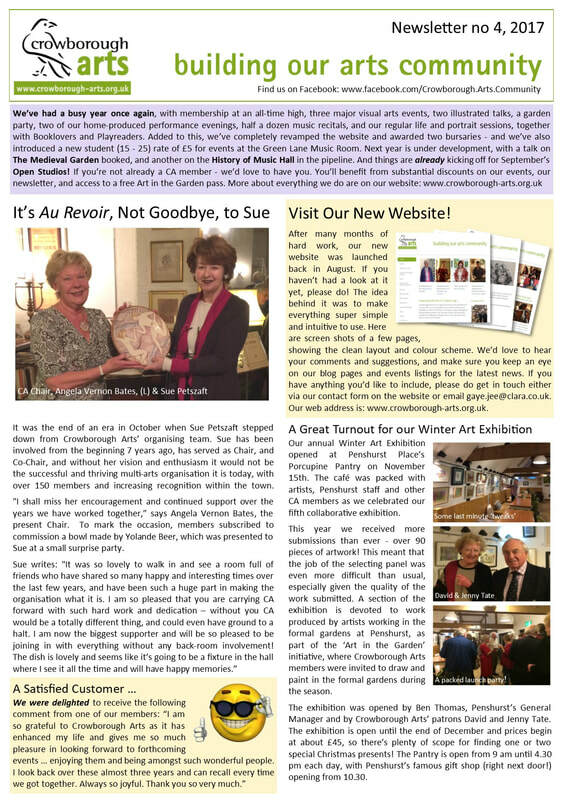 See the newsletter for more details. As ever, we’ve got some stunning performances coming up - book up early for Laura Snowden as it’s bound to sell out quickly. Later in the year, we’re delighted to have Bertie Pearce returning with another of his fascinating talks, this me about stage design. Watch this space for more information and SPREAD THE WORD! - let’s see if we can increase membership to 200.